President Viktor Yanukovich’s sudden, surprise departure from Kiev is the beginning of a long ordeal for Ukrainians. It’s also the start of a major threat to the several hundred thousand Ukrainian Jews. Anti-Semitic violence in Ukraine may come as a surprise to an American audience accustomed to optimistic portrayals of the swiftly changing events in U.S. media. The last weeks have been dominated by talk of vigils for democracy, for the EU, for Western ways, played out for the cameras in the bonfire-lit Independence Square. The Russian media, by contrast, have devoted time, since autumn, to explicating the virulent history of the ultranationalist neo-Nazi parties from western Ukraine that rally under the black and red flag of the grandfather of Ukrainian fascist parties, the 85-year-old Organization of Ukrainian Nationalists. Its flag can be seen in pictures of the parliament building surrounded by masked and helmeted protesters. In her Sunday appearance to discuss the crisis on “Meet the Press,” National Security Adviser Susan Rice was not asked about the fears of the Jews of Ukraine. Nor has the White House mentioned Jews or anti-Semitism during the several remarks directed at Moscow advising Russian President Vladimir Putin not to intervene in the Ukrainian chaos. In the coming days, either Yanukovich will choose to stay in Ukraine and contest the coup in Kiev or he will abdicate and pass the mess into the hands of the EU and Russia. Early indications from Moscow point to the likelihood that Yanukovich is unreliable. Russian President Vladimir Putin was on the telephone to German Chancellor Angela Merkel to sort out the failure of the EU to live up to the promises it made to Yanukovich and Moscow. Berlin insists that a solution for the disorder in Kiev not only includes a legitimate leadership with police power but also involves finding up to $27 billion to keep Ukraine solvent in its obligations. My sources point to a calm, adamant, confident Kremlin that will act to protect the millions of Ukrainians and Russian citizens who are at risk from the fascists and anarchists in general. The Jews are part of the population that Moscow will move to protect. My sources indicate that Russia will move to reinforce the military installations in Crimea and then prepare adequate means to help other regions where Russian citizens are concentrated, like Odessa. I wrote recently of the Kremlin’s opinion that Barack Obama’s administration has interfered in Ukrainian affairs. My sources have told me that the Kremlin holds that Rice has been in contact with the investor George Soros, who has used his wealth and influence openly to unsettle affairs in Ukraine at least since the Orange Revolution of 2005. The Kremlin maintains that the Obama administration has led the protesters to understand that Washington supports their demands to join with the EU and not with the Russian Federation. 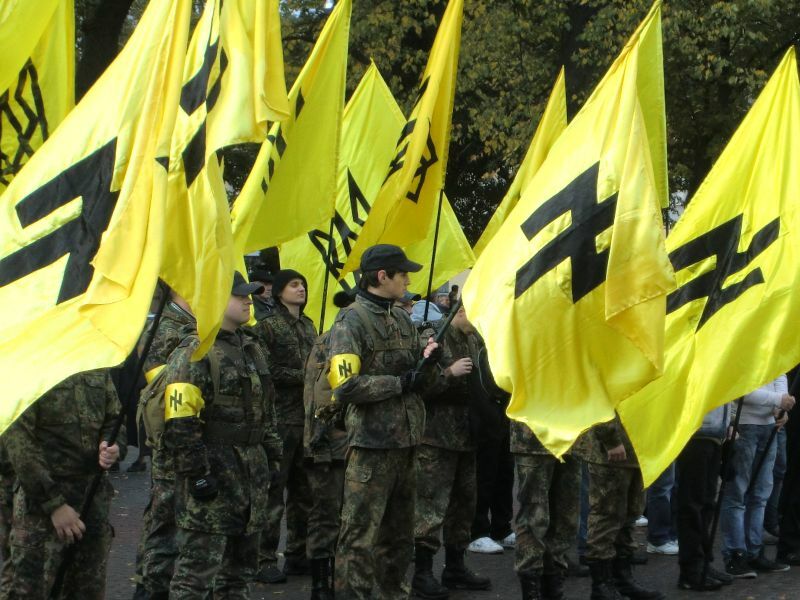 Is the US backing neo-Nazis in Ukraine? No more corruption in Ukraine? $5 billion program = 200,000 full time activists were funded? In the autumn of 2009, Svoboda joined the Alliance of European National Movements as the only organisation from outside the European Union. Well when there's no more countries left to destabilize in south Americas, Africa and the middle east. The globalist war machine just moves else where. I believe theres still a few countries left in Asia and eastern Europe there have'nt been totally destroyed and undermined yet. Now they (not much Communism) have switched allegiance to the new government? Unrest in Ukraine is contrary to Russian interest. The Nationalists supported Maidan because that suited their anti-Communism - not because they are pro-Europa. But the two have divided the political playing field between them and they control their country's political scene as though it were a business joint venture. Key positions, whether in ministries or in parliament, are all occupied by their people. Yanukovych's economics minister, for example, came from Akhmetov's team while the deputy prime minister, in charge of natural gas issues, answered to Firtash. It is a loveless marriage of convenience, but it has held.